American Lens: B & W Photography has opened at the Flinn Gallery at Greenwich Library for their 17th season. The exhibit focuses on the visions of five talented photographers. Each contributes a personalized observation of American scenes rooted by time and place. The exhibit explores the vision of photographers George Tice, Peter Bosco, Bruce Wodder, Bank Langmore and John Langmore. All works are for sale at the gallery. 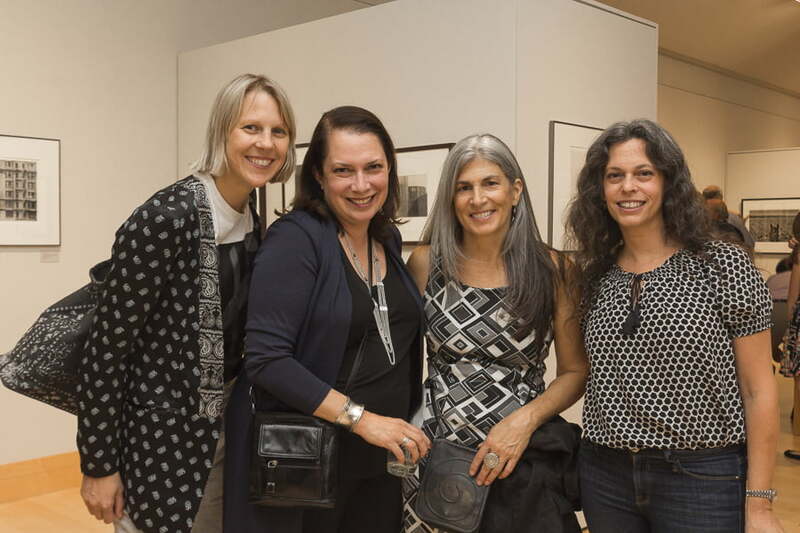 The opening was a lively mix, with four of the photographers present – and crowds of admirers. Legendary photographer, George Tice graciously signed his latest book, Seldom Scene, (being sold at the gallery for the duration of the show) his latest of 22 books, which contains 100 unpublished photographs. He was seen speaking and taking photos with his fans, – viewed the other artist’s works. Tice was a teacher/mentor to Peter Bosco and Bruce Wodder, so it was a thrill to see their different black and white photographic styles hanging together in one space. George Tice: Seeing Beyond the Moment is a film by Bosco and Wodder – and the Flinn Gallery is showing it on September 30th at the library. Both Wodder and Bosco will be on hand after the showing for an informal Q & A session, which they also directed and produced. Bank Langmore photographs convey, with humor and love, the toughness of the cowboy who labors in the sun and wind and the cold. The images depict the iconic cowboy’s gritty reality of working and living in the American West. He is considered a preeminent photographer of the American cowboy in the 1970s. John Langmore, son of Bank Langmore, a celebrated artist in his own right, has spent last three years photographing many of the same people and ranches his father documented over 40 years ago. His work shows his intimate familiarity with life in the saddle – while shooting from the saddle. He and his father attempt to show both the rewards and difficulties of cowboy life. John, inspired by his trips with of his father, left his career as a lawyer in Austin, Texas and hit the cowboy road. “At 12 years old I started working for a legendary outlaw breaking horses, and did so for a dozen years,” Langmore said. He has revisited many ranches that his father had documented 40 years earlier. Join him on Saturday, September 17 at 3:30 for an illustrated talk on The Cowboy Life. A Flinn special event! Bruce Wodder seeks out the rough beauty of the ordinary in his photographs series “Living in the Shadow.” He has long been fascinated by the juxtaposition of home and industry. These images depict lives led in close proximity to power plants, electric grids, and oil tanks. They describe the encroachment of industry and the environmental impact on our safest harbor, home. For his latest series of work, he said, “I scout out plants, reactors and such with close proximity to people’s living spaces.” His images seek the eerie intersection of the ordinary, the urban and the industrial. George Tice has long been known for his astonishing black and white prints, and his photographs have been exhibited and collected by museums around the world. He produces elegant and understated images that reflect the pursuit of the timeless American dream. On view, Tice’s extraordinarily detailed “From the Chrysler Building, NY, 1978,” compels the viewer to take a closer look. 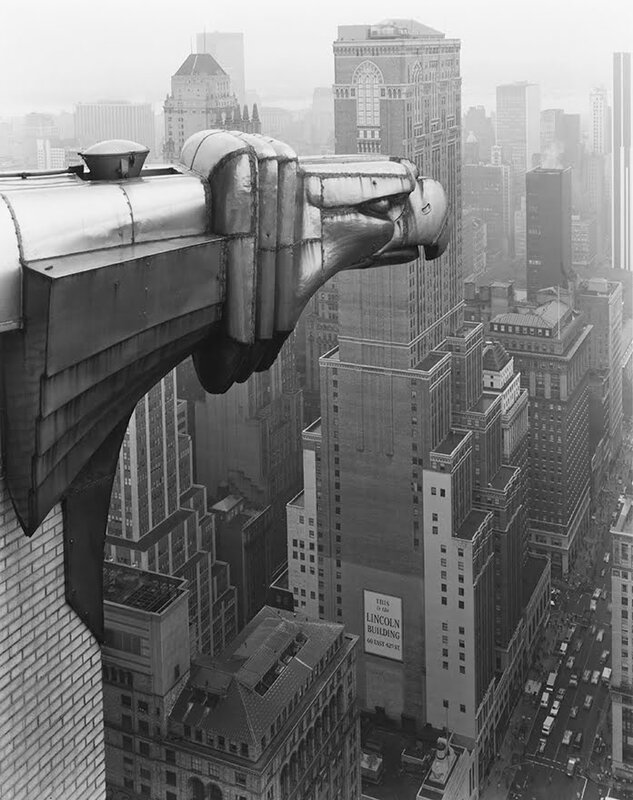 This work was commissioned by the City of New York, and Tice shot the image high up on the ledge of a 61st floor. “I took out an insurance policy for that shoot,” he said, adding that the risky shot proved to be one of his most celebrated photos in a career which has spanned over 60 years. He is currently working on his next book, “Lifework,” a two-volume retrospective. Tice uses a large-format, 8-by-10 film camera which he believes captures depth of detail and vast range of tones, from pure black to pure white. The wonder of many of these photographs is the range and subtlety of the tones between black and white. Visual images communicate meaning. Curators York Baker and Kirsten Pitts. Show assistants: Diane Stevens, Karen Sheer and Linda Butler. Credit: Karen Sheer. 1) Subject/Content: The components of the image and their arrangement – and where your eye is drawn within the image. 2) Perspective: The framing of the subject matter – the use of the camera to establish an illusion of intimacy, or sense of distance. 3) Audience/Content: The historical and cultural contexts from which the image emerged – and how it shapes the way a particular theme or subject is presented. The exhibit is sponsored by The Brand Gallery. Flinn Gallery is supported by the Friends of Greenwich Library.